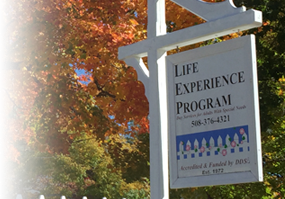 The Life Experience School was awarded a two-year license from Department of Developmental Services (DDS) in June, 2018 which was the 46th year of full certification by the Commonwealth of Massachusetts. The Life Experience School (LES) was founded in 1972, and is currently located in an historic building adjacent to the center of Millis, MA. Lewis and Meg Randa, directors of the organization, along with two long-term staff, provide services to 15 individuals. This Licensing and Certification review evaluated the LES Community Based Day Support (CBDS) services contracted by the Department of Developmental Services (DDS), via two audits. The Life Experience School is a unique organization that was founded on the principles of peace and social justice activism. An underlying goal since inception has been to empower people with disabilities to promote peace. Individuals and families affiliated with the organization have consciously embraced the humanitarian and social justice objectives promoted by LES. In keeping with this social justice perspective, the organization is deliberately non-hierarchal; individuals and staff have equal input on the decisions made at LES. The size and structure of LES lend itself very well to a flexible, person-centered approach to individualized services. Each person was fully involved in deciding what they wanted to work on and spend their time doing while at LES. Several people had started their own businesses (edible treats for horses, silver polishing service), several had been supported to find part-time jobs at local businesses, and a majority engaged in local volunteer work. Educational and leisure interests were also accommodated. People were encouraged to try new things and felt empowered to make changes in their activities as their personal interests changed. Individuals at LES were actively engaged in their local community, with ample opportunity to refine social skills and build meaningful relationships. In addition to the above referenced individualized endeavors, people were engaged in, many were also involved with an affiliated organization known as The Peace Abbey, located in Sherborn, MA. Social justice projects such as the Stonewalk and the Courage of Conscience Awards have earned international recognition for the humanitarian work promoted by LES and The Peace Abbey. The Life Experience School promotes a variety of daily experiences that meaningfully engage individuals with others in the community, affording people positive opportunities to learn and exhibit appropriate work-related interpersonal skills. Helping people understand social boundaries, appropriate topics of conversation, and how to positively engage with others were skills that clearly had been addressed and promoted, with very positive results. The Life Experience School promotes a variety of daily experiences that meaningfully engage individuals with others in the community, affording people positive opportunities to learn and exhibit appropriate work-related interpersonal skills. Helping people understand social boundaries, appropriate topics of conversation, and how to positively engage with others were skills that clearly had been addressed and promoted, with very positive results. The Life Experience School currently supports ten individuals. Each individual was engaged in a variety of interests and activities that they had agreed to and/or helped formulate. Some activities were unique to the individual, i.e. part-time employment. Other pursuits had been agreed upon by several individuals, i.e. two people had started a small business making and selling edible treats for horses. Individuals also had the option to be involved in large group projects, often in affiliation with the Peace Abbey, which is a separate organization closely affiliated with the Life Experience School. Fostering relationships is a fundamental focus at the Life Experience School, which views itself as an extended family. Given the small size of the organization (ten individuals, four staff), the longevity of some of the relationships (46 years), and the humanitarian work everyone is engaged in, the centrality of forging enduring and meaningful relationships was evident. The organization has in fact extended support to individuals and their families in multiple circumstances that go well beyond the expectation of the contracted CBDS services.